Last week I had a very excellent opportunity to go on a day trip out of town for work. I case you didn’t read my post yesterday, let me tell you a little about it! The outreach department at my museum runs educational trips called Teacher Treks that take groups of teachers out of the city to get hands-on experience in the field so that they can incorporate what they learn into their classrooms. Last week’s trip was focused on dragonflies and damselflies (aka, the odonates) and the lead instructor asked if I would help out. I jumped at the chance and I’m so glad I did. I don’t feel like I contributed a whole lot other than creating a long handout about dragonfly behavior and making myself available to answer questions, but I had a blast! We spent a couple of hours in the classroom covering some odonate basics in the morning, such as the differences between dragonflies and damselflies, how to identify odonates using a field guide, and some information about the behaviors teachers and their students are likely to observe in the field. Then we quickly ate our lunches and headed out for the best part of the day: odonate observation in the field! We were out in the field only a few hours, but I learned a lot during that time. 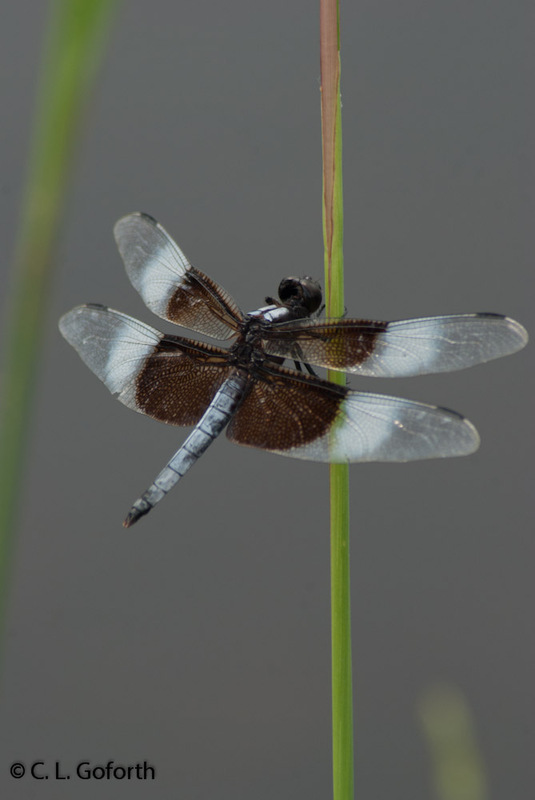 Working with the dragonfly expert from State Parks was great because I could take advantage of his superior knowledge of the local odonates and learn how to identify some of the unfamiliar species. I also haven’t had much time to get out and explore the dragonfly diversity of North Carolina, so going to a new place and seeing a bunch of new species was absolutely wonderful! And working with a group of enthusiastic museum personnel, State Parks people, and K-12 teachers made the whole experience even better. With one exception, everyone there was very excited to learn more about dragonflies, including the instructors! 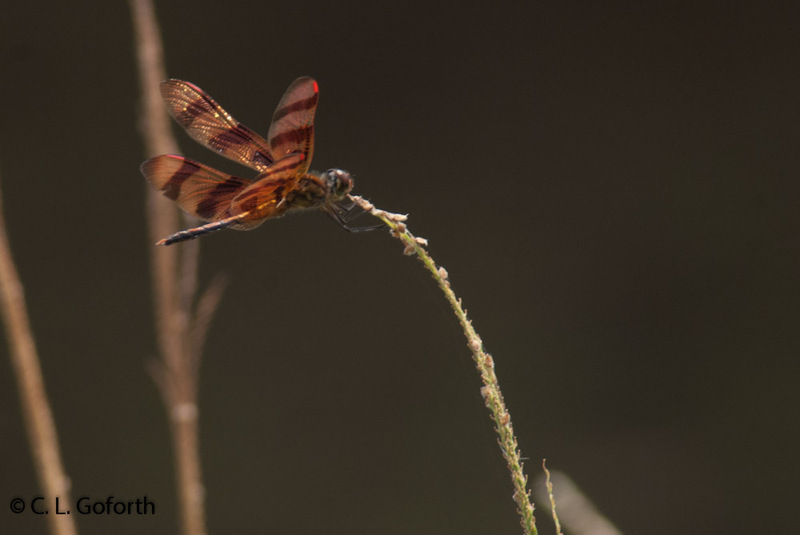 For me, there are few things better than getting out into the field to watch and photograph dragonflies while sharing what you know with a captive audience like that. What a great day! Amazing photographs, I never realised the variety of dragonflies that exist, I suppose the variation in colouration is much less noticeable in Europe with fewer species. Beautiful photos! 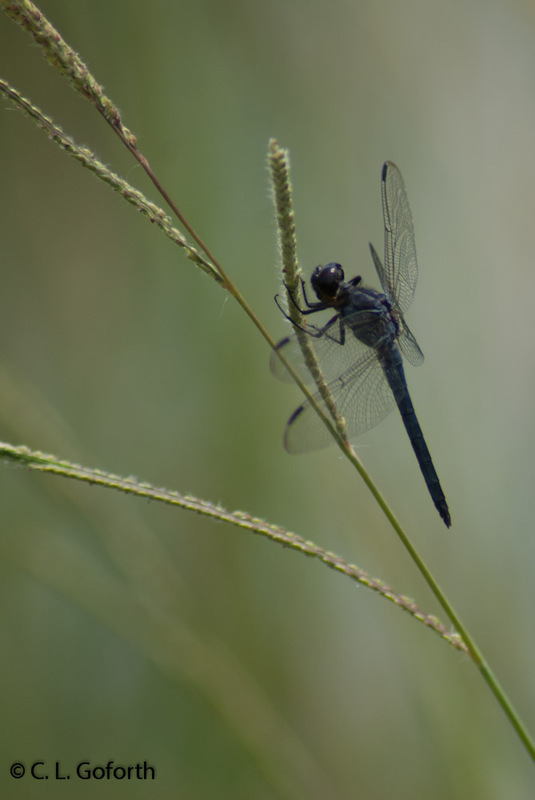 I’ve never seen a golden-winged skimmer nor a slaty skimmer. Nor have I seen the fumipennis subspecies of the Variable Dancer; up north we get the violacea subspecies which doesn’t have the black wings. So I’m feeling a bit of envy right now. But I do agree, those Halloween Pennants are stunning. I may just like the itty bitty Eastern Amberwings better though, they’re just too cute. Really? The amberwings are superior to the Halloween pennants to you? Interesting! I’ve never heard anyone go for the tiny little guys, though they are quite beautiful. I’ll admit that I do prefer the Mexican amberwings to the eastern though. The color of the wings in P. intensa is simply spectacular – much brigter than tenera. Oh, I’ve always had a thing for smaller, more overlooked insects. When other’s go for the megafauna, I go for the little guys. Perithemis tenera are beautiful little wasp mimics, at least the males are. The females have wing patterns more like some of the Libellula, which is beautiful as well. And then there’s all the little details I notice when I get them (the males) in hand: the yellow-green stripes and face, the cherry red stigmas, the bicolored eyes. And for little guys, they’re tough! Watch as they fight off much larger males of other species that wander into their territory. I’ve seen one wrestle with a Pantala male, which is at least twice the size of an amberwing. I love the pennants as well, but there’s just something about seeing a group of Perithemis over a pond that never fails to excite me. 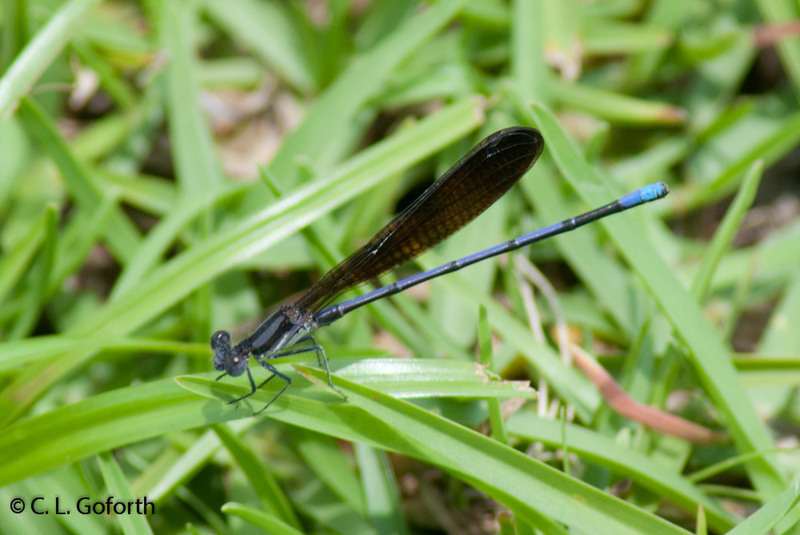 The tenera are definitely zesty little dragonflies! I enjoy watching them quite a bit, and they have an amazing site fidelty that I admire. They live in the grassy areas of my apartment complex and they’ll return to the same little stick of grass over and over and over, regardless of how many times they’re disturbed or blown off. They’re tenacious! It was so fun! I am so happy that I am encouraged to participate in these sorts of things too. And you’re totally right – getting out with kids IS fun, though the teachers in this group were the best group of adults you could hope for. They were very enthusiastic about learning about odes and it made the trip a ton of fun! The calico and the variable are so pretty! I’m glad you got to photograph them. Ha ha! 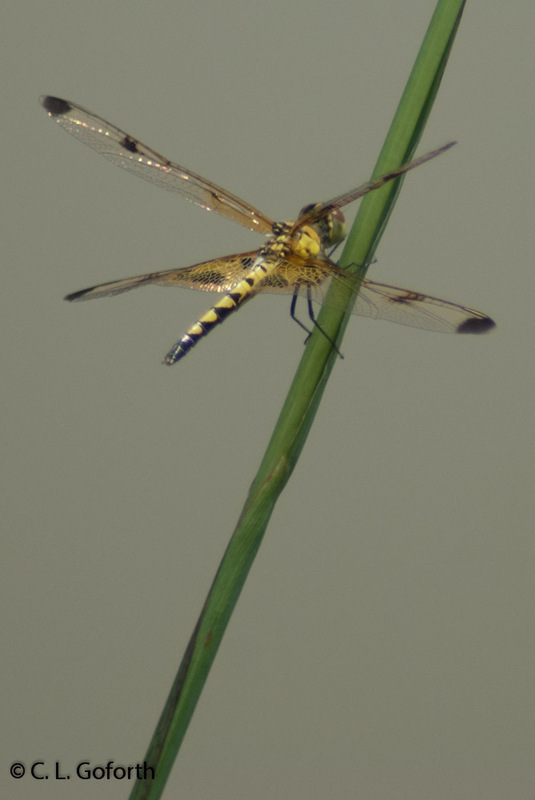 The dragonflies that sit still are pretty awesome. Happily, it was quite hot while we were at the hatchery, so I was able to get photos of some things I don’t think I would have gotten decent shots of otherwise. It was apparently too hot to fly because nearly everything was sitting in the vegetation rather than patrolling. Of course, all of the people in our group were melting too, but it made for some easy photographs! Great pictures! It’s nice to see the variety in dragonflies.